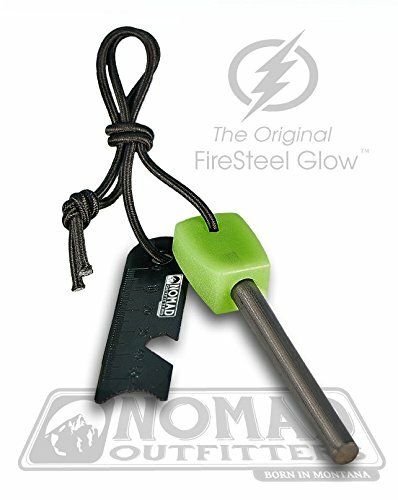 NOMAD OUTFITTERS® presents the FIRESTEEL GLOW®, the original military-grade emergency glow-in-the-dark firestarter. Please do not accept cheap knock-offs of our brand. This firestarter is a necessity for any diehard outdoorsman, hiker, hunter or backcountry traveler, the FIRESTEEL GLOW® could very well save you or your loved one's life. When all else has failed the FIRESTEEL GLOW® delivers. Striking the Saber-Claw Spine Scraper against the thick 5/16" Triple-Strike 15,000 ferrocerium rod generates powerful large sparks that will easily ignite dry tinder or magnesium filings, and enable you to start a fire in the harshest of weather conditions. Featuring a LUMILIGHT NIGHTGLOW® glow-in-the-dark handle, an extra long premium shockcord lanyard, and a 6-function multi-tool scraper, which provides a ruler, map scale, bottle opener and hex key wrench, the FIRESTEEL GLOW® is one of the most indispensible, safest and must-have tools for survival. Whether you are lighting a campfire, bonfire, BBQ, or just need a quick flame, the FIRESTEEL GLOW® also has you covered. No need to fumble around with matches--simply shave a small amount of tinder using the concave serrated side of the scraper. Next, hold the rod at an angle over the pile and forcefully slide your striker along the length of the rod until sparks land directly on tinder and ignites the fire. NOMAD OUTFITTERS® manufactures the highest quality survival gear for men and women. Whether you are hunting, camping, fishing, biking, hiking or just like to be prepared, our gear prepares you for the unexpected. The FIRESTEEL GLOW® is the ultimate survival gear accessory. Order yours today and experience the peace of mind that comes with being prepared! COMPACT - CONVENIENT - SAFE : at only 1.6oz it's perfect for Backpacking, Hiking, Camping, Bushcraft, Firecraft, Hunting, Fishing, Bugout, Boy Scouts, EDC, Emergency, Survival, Campfire, Camp Stoves, BBQ etc. If you have any questions about this product by Nomad-Outfitters, contact us by completing and submitting the form below. If you are looking for a specif part number, please include it with your message.